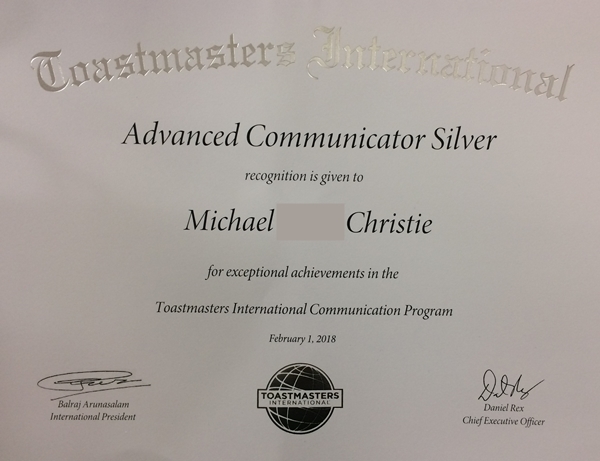 I recently completed my Toastmasters Advanced Communicator Silver (ACS). I’m pleased with having achieved that. I somewhat accelerated my reaching that goal, as Toastmasters is moving to a new program called Pathways. As vice president for education at my club I felt that I needed to be leading by example with respect to Pathways, but I wanted my ACS first. At the same time we are moving our physical location. The church where we had been meeting has sold its property and is downsizing to a leased facility. We are moving with them, for just two weeks until we move to our permanent home at the bank up the street. It’s a liminal time and perhaps time to think about where I want to go with my Toastmasters experience. It is to be determined.